Chad Muska doesn’t want to talk about how much weed he smoked 20 years ago. It was enough, however, to warrant a pocket hidden behind the tongue of his first and only éS model, released in 1997. Raised in Las Vegas and Phoenix, Muska washed up on San Diego’s Mission Beach as a teen. There, he subsisted on the generosity of the daughters of wealthy tourists, starting his days, he boasted in interviews, with a 40 on the beach. And thus began his rise. He soon moved from G&S to its successor, Maple, and, finally, Toy Machine, the board company that turned him pro in 1995. He was also among the earliest riders on éS, an elite Etnies offshoot, alongside skaters like Sal Barbier, Eric Koston, and Tom Penny. His fashion sensibilities, meanwhile, spawned a legion of imitators, teenaged skaters who, in a salute to their idol, bedecked themselves in cargo pants and visor beanies, even if they wouldn’t so much as roll up to the handrails or Hubbas he skated in earnest. He was, for the the rest of the ‘90s and the beginning of the ‘00s, a Jordan-like figure—if, in addition to playing like their hero, Jordan’s most devoted fans aspired to wear his wide-legged jeans, too. The conversation about Muska’s first signature model began as his popularity was spiking. 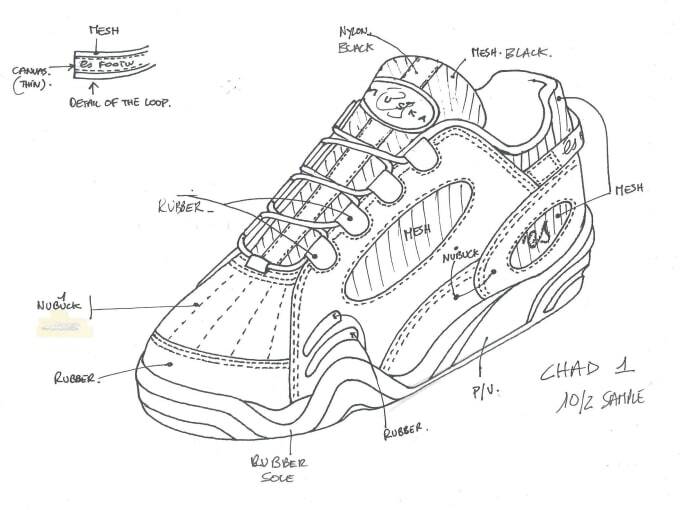 At the time, skate shoes were taking design cues from athletic footwear. And signature shoes, once a late-career honor reserved for legends, were growing more common. Koston had just introduced the first model with a visible airbag, while Barbier’s inaugural shoe had a 23 on its heel. If the stash spot fell into the latter category, it also served as a differentiator. 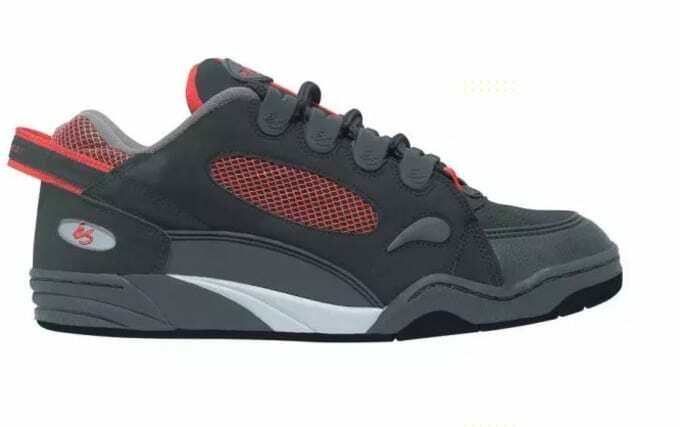 Though the shoe featured an upper that was part mesh, inspired by the Jordan IV, along with a prominent heel tab, the pocket, a four-and-a-quarter-inch-long compartment with a three-inch opening and a Velcro closure, was its defining flourish. Boistel says Muska wanted to create a “bulletproof” shoe that could withstand his brand of skating. To that end, they incorporated rubber in the model. Lots of it. At one point, its toe was meant to be a rubberized nod to the Superstar. It was also slated to have a visible airbag, but Muska says the concept was nixed over of an issue with the shoe’s midsole. The stash was Muska’s idea, Boistel says, though he and the skater offer conflicting accounts of its development. While Boistel says they nailed it in the first samples of the shoe, Muska doesn’t think the feature, in part an adult take on Kangaroos’ children’s sneakers’ main selling point, was ever perfected. Still, for the consumer, the ability to conceal weed—or carry a set of house keys—in one’s sneaker eclipsed any shortcomings in the pocket’s design. Don Brown, chief brand strategist for Sole Technology, recalls hearing that San Diego police had begun stopping skaters and searching their footwear. “They used to think that all skateboarders had stash pockets in their shoes, so they’d just be pulling people over, just checking their shoes,” he says. Schools were also rumored to have warned teachers about the model and what students might be hiding in it. Not that it mattered. By that point, the skate industry had begun to recognize shoes for the cash cow they were. With few, if any, athletic brands showing sustained interest in skating, established players like Sole Tech were able to shape skateboarding footwear alongside newer brands like DC and Axion. At the same time, their signature riders began to earn more than a board sponsor could pay them. Competitors quickly aped the stash spot. Shortly after Muska’s shoe came out, Osiris dropped a Tyrone Olson model with its own stash. Muska also pushed the concept further, releasing a signature Shorty’s bag with a pocket designed for a 40-ounce bottle of beer. 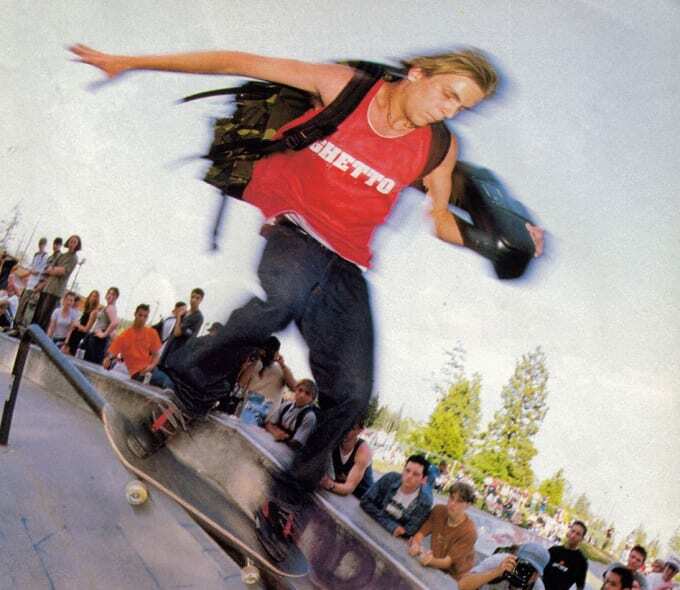 Chad Muska in his signature sneaker. Image via Transworld Skateboarding. Thanks to the momentum events like the X Games generated, skateboarding was thriving, and skateshops could easily move $100-plus sneakers and overpriced backpacks. Despite the success of his shoe, or perhaps because of it, Muska walked away from éS. He partnered with Four Star, a snowboard distributor, and in 1999 he launched Circa. “It was really exciting at that time, being able to start something that was mine and that was completely new and that I could retain ownership in and have a lot more freedom in design and building a team and the marketing behind it,” Muska says. Circa’s shoes carried aspects of the éS design ethos forward. Muska’s models featured multiple iterations of the stash spot, some using zippers, others using Velcro. Muska also included the stash on his first Supra Skytop. And though skate shoes shed much of their bulk in the years that followed, moving toward stripped-down, vulcanized silhouettes, the hidden pocket materialized on Omar Salazar’s Nike SB model in 2010, as well the popular "Skunk" and "Cheech and Chong" Dunks. Last spring, Adidas and Bait put the pouch on their Stan Smith Vulc “Happy” collaboration for 4/20 last year, a shoe with a hemp upper. And later last year, Nike included a pocket in the tongue of its SF-AF1. Still, the stash appears to be long gone from skating. In the eyes of Muska, hidden compartments and airbags don’t embody the technological leap they once did. Today, though the creative impulse that yielded the stash spot lives on, the pocket it produced does not. And Muska, the skater whose vices helped birth it, doesn’t see it returning to skate shoes anytime soon. “The stash spot might be resting in peace forever."